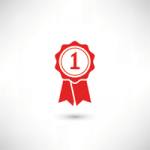 This is a 2-part series on CNV setup & quality assessment – to read part 1, click here. In the final stage of our first blog in this series, the CNV algorithm was run and produced the CNV table. Now the focus will be on filtering to high quality and known CNVs, checking to see if our samples are all high quality, and how to track CNVs across multiple projects using assessment catalogs. 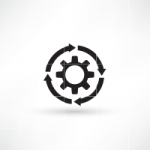 Let’s start with some key steps in filtering CNVs. After running the CNV caller, the list of the CNVs in the table reflect all CNVs across all samples. Therefore, some events are listed with a CNV State as missing (?) (Fig 1). Let’s start by filtering to events only seen in one specific sample. 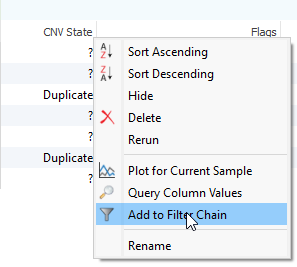 Right click on the CNV State column header and select Add to Filter Chain (Fig 2), and you’ll see the new filter card generate in your CNV filter chain. Fig 1. 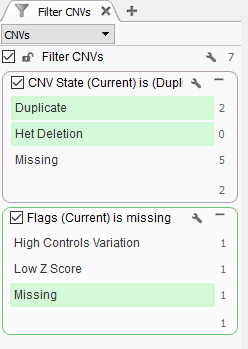 CNV table before filtering, showing all events across all samples. Events in other samples are presented as missing (?). Fig 2. Applying the CNV State field to the CNV filter chain. The result shows the duplications and deletions for the current sample 13. Fig 3a. Report of quality flags in the CNV table. Fig 3b. Adding the Flags field to the filter chain and selecting missing to prioritize high quality events. Fig 3c. Applying the Flag filter to narrow the search to a single event in Sample 13 that has no quality flags. Low Controls Depth: Mean read depth over controls exceeded the threshold. High Controls Variation: Variation coefficient exceeded the threshold. Within Regional IQR: Event is not significantly different from surrounding normal regions based on regional IQR. Low Z Score: Event is not significantly different from surrounding normal regions based on regional IQR. Another quality field we can include in our filter chain is the p-value field. The p-value is the probability that the z-score (standard deviation value of the event) at least as extreme as those in the event would occur by chance. The user can set the confidence threshold to their needs, but you can easily filter down to strong calls by setting a strict confidence value (Fig 4). Fig 4. Adding the P-value field to the filter chain to isolate high confidence events. Additional quality considerations include looking at the sample level information which can be seen in the samples table (Fig 5a). The samples table is helpful in seeing if there are any low-quality sample flags and also get an idea of how similar the individual SOI (Sample of Interest; i.e. imported samples) is to the reference samples (Fig 5b). Fig 5a. 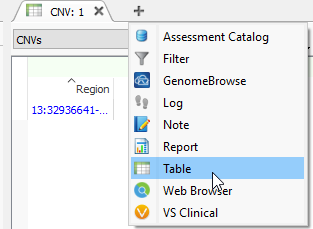 Opening a new table by clicking on the + icon. Fig 5b. CNV information in the Samples table showing important quality fields such as Sample Flag and the average percent difference for the reference sample set used during normalization. Consider the hypothetical scenario where you have a sample in your project that has a high number of events that don’t seem realistic. The first place you may check is the samples table to see if there are any sample flags and if the percent difference from your reference set is higher than expected. In this project, the maximum percent difference for any sample is about 11.5% which is well below the 20% threshold set with the CNV caller. High Median Z-score: The median of all the z-scores was above 0.4. This indicates a general skew of this samples away from the reference samples, likely to cause excessive duplication calls. The quality check steps previously mentioned are likely to fall into your standard workflow and are powerful tools to isolate good quality events. However, the reality is that each users project may present edge case scenarios. So, if you come across events that present more questions or concerns, please don’t hesitate to contact our support staff to assist with clarification in your results. Filtering on quality of events is a great first step in prioritization of your CNV calls, and the next step may be to isolate the obvious events seen in public databases. 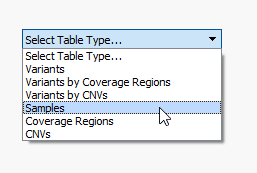 After you run your CNV caller, you’ll have the option to annotate on the CNV table by clicking on Add -> Secondary Tables -> CNV Annotation (Fig 6a). To gain access to all of the CNV annotations available, click on CNV and large Variants subdirectory under the Public Annotations available on our server. Fig 6a. Accessing the annotations for the CNV table. Fig 6b. List of Golden Helix curated and available CNV annotations on our server. Available to annotate your CNVs among many other variant/region/gene tracks available to all users. Fig 7. Creating a filter card on the clinical significance field in ClinVar CNVs to isolate known pathogenic events. In addition to filtering on curated public annotations, we make available, the user can build their own annotation (i.e. 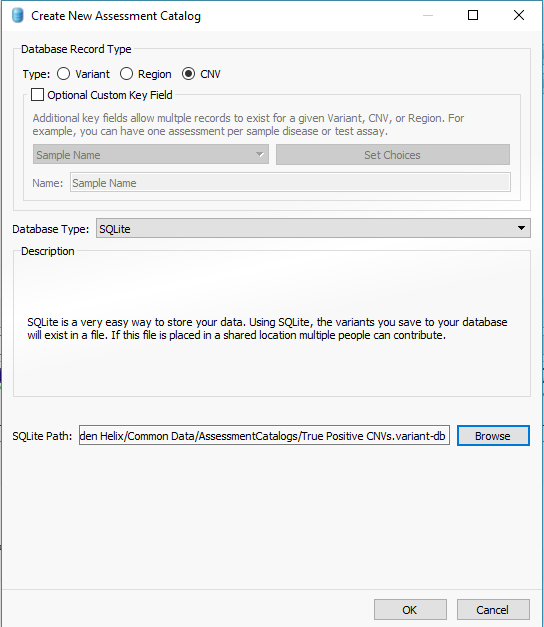 assessment catalog) to track variants/regions/CNVs. 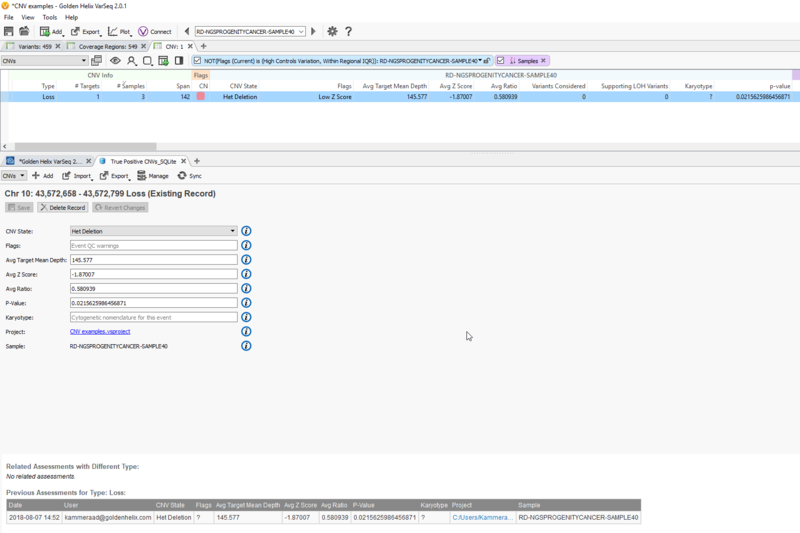 Keeping the subject tied to CNVs, the user can easily keep track of events seen across projects. The goal may be to keep track of false or true positive events across samples. In any case, you can build the assessment catalog to keep track of any information you would like. 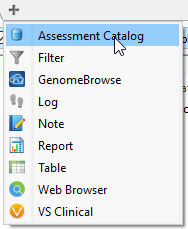 To create a new assessment catalog, click the + icon to open a new tool and select the assessment catalog (Fig 8a). 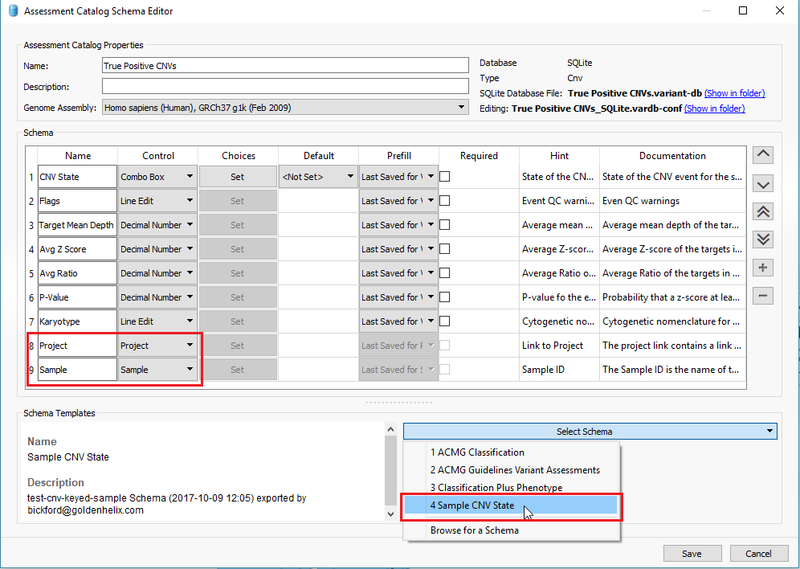 You’ll make the CNV based assessment catalog and decide where you’d like to store the new track being created (Fig 8b). When building the individual fields to be stored in your assessment catalog, you’ll have many customizable options. To simplify this process, we created a schema you can use to build from. In this example, I also added two additional fields: sample and projects records (Fig 8c). Here is a link to the finer details of building an assessment catalog. Fig 8a. 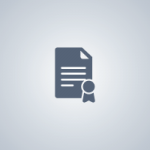 Click the + icon to access the assessment catalog function. Fig 8b. 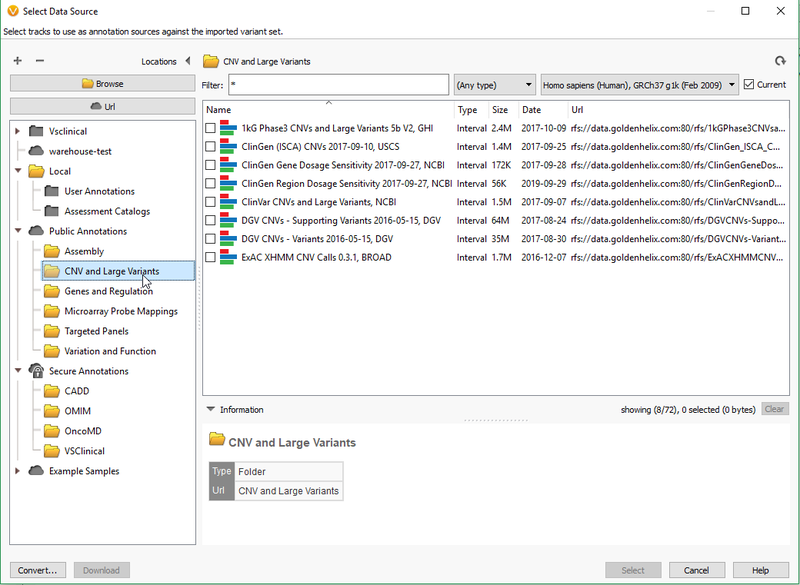 Building a new CNV based assessment catalog and saving it to the assessment catalog folder created when installing VarSeq. Fig 8c. Creating a new assessment catalog by selecting either a schema to build from or built from scratch. In a previous project, I flagged a specific event in Sample 40 and entered all the necessary information for the event in the assessment catalog (Fig 9). All the entered information will be stored in the catalog, and we are going to load it back into the CNV table of our current project. Once you create your assessment catalog, you’ll see it as a list of optional annotations (Fig 9b). When we do this, we see that out of the six SOIs in the project Sample 1 has the same event. This event matches the heterozygous deletion seen in Sample 40 from the previous project (Fig 9c). Users can build assessment catalogs similar to this example to annotate against true events seen in previous samples to confirm true events in future samples. Fig 9a. Adding a record event to the assessment catalog to annotate against future projects. Fig 9b. 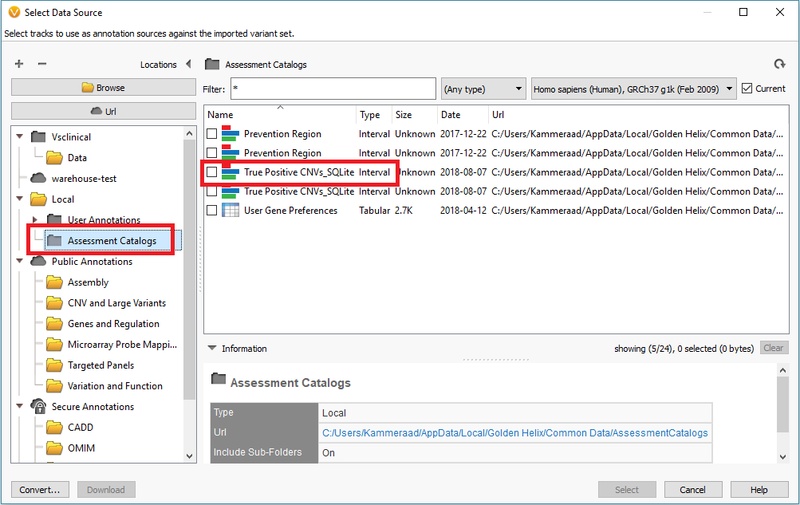 Accessing the custom assessment catalog to annotate against the CNV table. Fig 9c. Adding the assessment catalog to the CNV table allows you to view all the recorded events seen before and that match events in other projects. 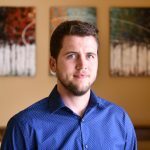 With this two-part blog series, users should now be able to perform CNV analysis using their data, set up basic quality filter standards to isolate high-quality events and utilize annotations to hone in on publicly known events as well as in-house recorded CNVs from previous projects. There are a number of features to explore with CNVs and other tools in VarSeq and we would strongly recommend you reach out to us at Golden Helix support (support@goldenhelix.com) if you have any questions on capabilities. HI, Darby, I have a problem with low coverage WGS looking for CNV: When it comes to data QC, it’s also used” Low Controls Depth“，”High Controls Variation“，”Within Regional IQR“ and “Low Z Score” as the QC flag? Does the cufoff value is the same as the normal coverage value?